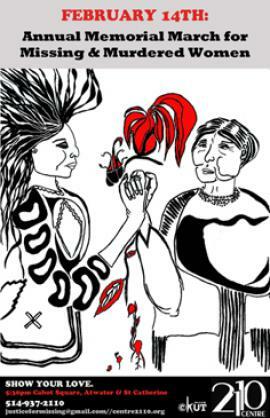 Tune in for a special 2 hour broadcast from 5-7 PM on Tuesday, February 14th dedicated to sharing the realities faced by Indigenous women who have lost loved ones and highlighting the reslience and strength of initiatives to counter this gender based violence. Interviewees include Bridget Tolley and Sue Martin of Families of Sisters in Spirit, Michele Audette of Quebec Native Women and Gladys Radek of Walk 4 Justice. At 5:30 PM we will broadcast LIVE from the 3rd Annual March for Missing and Murdered Women at Cabot Square. Tune in for the voices of Missing Justice and the Girls Action Foundation, as well as live performances and updates from march-ers. Visit Missing Justice for more information.